Artwork of a Silver Medal. 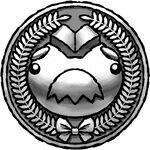 A Silver Medal (also known as Silver Happiness Medal) is a collectible in the Game Boy Advance game Yoshi Topsy-Turvy. A Silver Medal is earned if Yoshi gets a score near the required one set by the Spirits. As an example of this, if Yoshi collects an amount of Coins near the target set by the Spirit of Greed, he wins a Silver Medal. Additionally, the player gets two chances in the Bonus Chance!. This page was last edited on February 12, 2018, at 23:51.